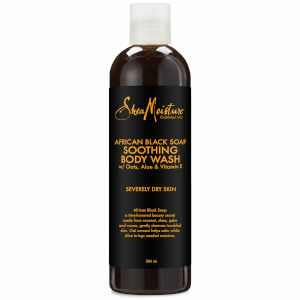 Experience a soothing cleanse with Shea Moisture African Black Soap Soothing Body Wash, a gentle formula enriched with natural and certified organic ingredients. Suitable for severely dry skin, the gently cleansing body wash delicately lifts away dirt and impurities while moisturising the skin and balancing oiliness to promote a clearer appearance. Its dose of soothing Oat extract helps to calm irritated skin while absorbing excess oil, and moisturising Aloe has a calming effect on dry, sensitive skin. Packed full of beneficial ingredients, the conditioning body wash also contains antioxidant Vitamin E to protect against external aggressors. Skin feels cleansed, calmed and hydrated. Suitable for severely dry skin. Water (Aqua), Sodium Lauroyl Methyl Isethionate, Cocamidopropyl, Betaine, Glycerin (Vegetable), Fragrance (Parfum), Jojoba Esters, Caramel, Caprylyl Glycol, Guar Hydroxypropyltrimonium Chloride, Butyrospermum Parkii (Shea) Butter* **, Caprylhydroxamic Acid, Tocopherol, Glycine Soja (Soybean) Oil, Sodium Palm Kernelate, Sodium, Shea Butterate, Sodium Cocoate, Theobroma Cacao (Cocoa) Plant Ash,, Aloe Barbadensis Leaf Juice, CI 77499, Avena Sativa (Oat) Bran Extract, Sodium Chloride, Coumarin.